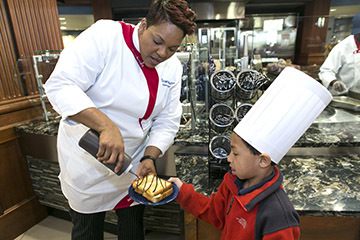 A group of children participating in a program intended to expose low-income and homeless students to career opportunities in fields such as construction, culinary arts, engineering and veterinary medicine recently visited the caf, Samford University’s main dining hall, to learn about careers in the food industry. Jen Hartzog, director of admission at Samford University’s Cumberland School of Law, helped to spearhead the weeklong spring break camp, “Oh, the Things You Can Be,” as part of her participation in Project Corporate Leadership, a program for upwardly mobile managers and professionals in Birmingham. Hartzog coordinated the visit with the help of Samford Executive Chef Christie Butler and members of her staff. Hartzog and four other Project Corporate Leadership participants — Marvin Burrell of Alabama Power, Thomas DeBray of Balch & Bingham LLP, Russ Kolmin of Protective Life Insurance Company, and Erica Sellers of YMCA of Central Alabama — teamed up to make “Oh, the Things You Can Be” a reality. The children who attended the camp were kindergarten through 8th-grade students who attend YMCA Central Alabama’s After-School Enrichment Program. Each day of the weeklong camp focused on a different theme, and the children visited various work sites around Birmingham throughout the week. Themes included careers in architecture, engineering and building maintenance, utilities field, working with animals, farming, landscaping, preservation and plant sciences, and the food industry. During the visit to Samford, they learned about people who grow, distribute, sell, prepare and cook food. They were able to tour the commercial kitchen at Samford, cook with Chef Butler, and learn from many other members of her staff about jobs in the culinary industry such as being a chef, a prep cook, the person who orders the food and a nutritionist. Afterward, the children enjoyed lunch in the caf. The Samford athletics department donated drawstring backpacks for the children, which were received with great enthusiasm, Hartzog noted. Partners for the camp included Protective Life Insurance Company, Samford, Wells Fargo, EBSCO Industries Inc., Birmingham Botanical Gardens, Burr Forman LLP, Alabama Power Company and Huckestein Architects PC.